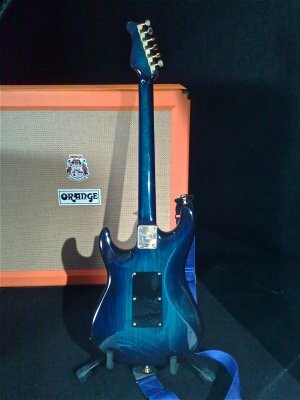 This is a one piece swamp ash body, with a highly figured maple neck with a rosewood board. I found this in the south of England. 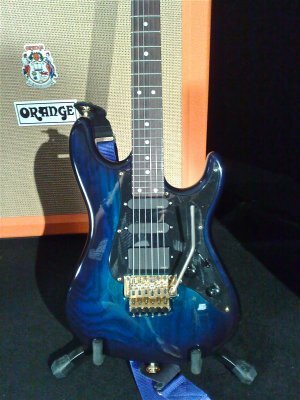 The owner had gone over to playing Suhr guitars and sold it to finance another purchase.. I must be the 3rd owner. 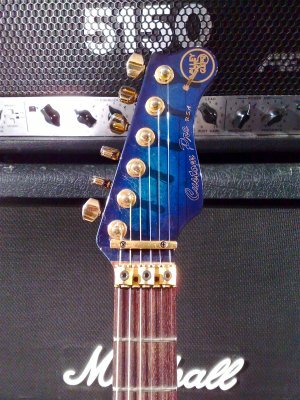 It had some rubbish dimarzio pick ups in it, and a schaller trem. I gave it to my tech to get it back to how it should be, and we put a set of the Steve Lukather emgs in it, and through my contacts with fender, we sourced a proper unused gold Floyd from the late 80s or early 90s to go on( the shaller is a va stamped one, so i will keep it with guitar) . 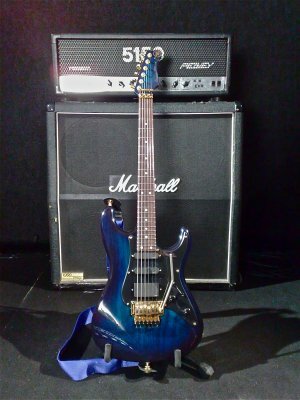 It's now is an incredible playing guitar, with a big fat sound. The colour is really cool too, because it looks black, until the light hits it, and then it just explodes with the blueburst finish.